Overall fish production registers an increase of approximately 18.86% in comparison to the last three years & inland fisheries sector registers a growth of 26%: Union Agriculture MinisterCombining the production of all types of fisheries (capture and culture), the total fish production in the country reaches at about 11.41 million tonnes in 2016-17: Shri SinghShri Radha Mohan Singh addresses at function of 'World Fisheries Day' celebrationUnion Agriculture and Farmer Welfare Minister, Shri Radha Mohan Singh has said that the previously implemented "Letter of Permit" or "L.O.P." system in the E.E.E. has been stopped since January, 2017. Besides, specific decisions have been taken to safeguard the interests of traditional fishermen in the area of EEZ beyond 12 nautical miles, which is regulated by the Government of India, such as the traditional fishers have been exempted from the fishing ban implemented during monsoon period in the EEZ; use of LED lights/other artificial lights for fishing as well as practice of bull-trailing or pair-trailing have been completely banned, recently on 10th November, 2017. The duration of fishing ban has also been increased from 47 days to 61 days, with the consent of all coastal State Governments. Shri Singh has said that the scheme 'Blue Revolution' has been launched with the outlay of Rs. 300 crore for the integrated development of the Fisheries sector in the country. As a result, overall fish production has registered an increase of about 18.86% in comparison to the last three years, whereas inland fish production has registered a growth of more than 26%. Combining the production of all types of fisheries (capture and culture), the total fish production in the country has reached at about 11.41 million tonnes in 2016-17. Shri Singh further said that about 1.5 crore people in the country are employed in the fisheries sector for their livelihood. The Union Agriculture Minister said about in a function organized on "World Fisheries Day" in the National Agricultural Science Center (NASC) complex, Pusa Road, New Delhi. It is worth mentioning that 21st November is celebrated as a World of Fisheries Day worldwide every year. In India, which is the second largest fish producing country, the World Fisheries Day is being celebrated from 21st November, 2014 and it is being celebrated for the fourth consecutive year. The theme of this year is "2022 ka hai sapnaa…... kisaan ki aay ho duguna – Sankalp se siddhi". Shri Radha Mohan Singh also inaugurated the World Festivals Day celebrations. Smt. Krishna Raj, Minister of State for Agriculture and Farmers Welfare was also present on the occasion. Shri Singh emphasized that the vast aquatic resources present in the country provide more opportunities and potential for further development in fisheries sector. He said that main aim of Blue Revolution Scheme is to increase the fish production and productivity to up to 8% annual growth rate and to produce 15 million tonnes of fish by 2020. 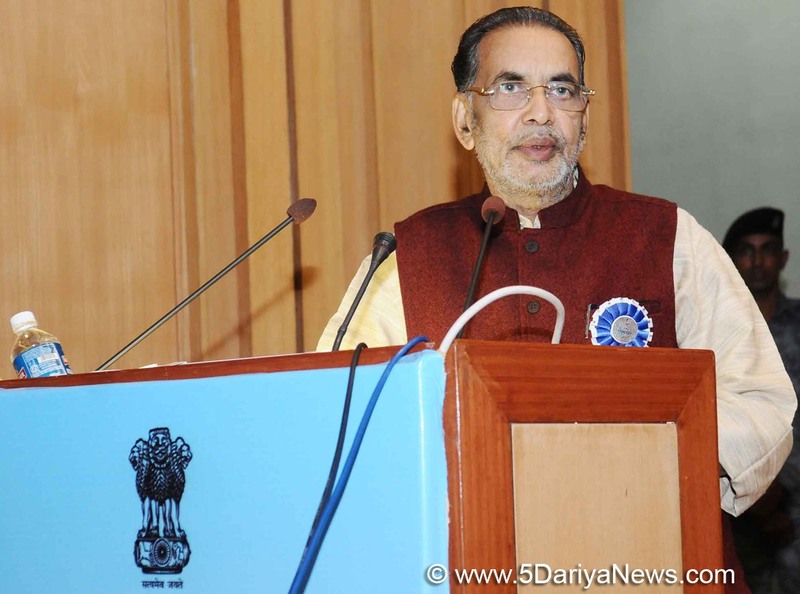 This scheme will contribute significantly to achieving the targets of doubling the income of farmers and fishermen by 2022.Shri Singh said that in line with Blue Revolution Scheme and with active participation of all the States / Union Territories, Government of India has taken effective steps and proposed a long-term plan "Blue Revolution Mission-2016" for the period from 2015-16 to 2019-20. Under this scheme, it is proposed to achieve full production capacity and increase the fish productivity from the aquatic resources and aquaculture in both inland and marine sectors. Smt. Krishna Raj, Minister of State for Agriculture and Farmers Welfare, said that India has a fleet of 2.48 lakh fishing vessels, and the country has exported fish products amounting to US$ 5.78 billion (Rs. 37,871 crore) during 2016-17, which is the highest export from the country so far. Globally, the value of export of annual fish products ranges from 85 to 90 billion dollars. Smt. Raj also informed that in the last decade, where the average annual growth rate of fish and fish products was recorded at 7.5%, India remained the first place with an average annual growth rate of 14.8%. She also informed that more than 25% of the world's protein diet is obtained by fish, and that the human population consumes more than 100 million metric tonnes of fish per year in the form of food.